Discover how your Life will have so much more JOY when you have the thought that Life is inevitable! 40 years of wisdom in discussing the prospects of longevity and life extension. Stretch your mind to connect with a Spiritual Power that can help you overcome death. rebirther, lecturer, and healer, with a renowned expertise in the area of relationships. Inspired by President Kennedy in the 1960’s, SONDRA RAY was a pioneer in the first 10 groups of the PEACE CORP, an experience which gave her the lifelong dedication to world service. 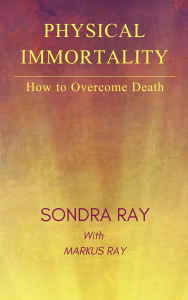 SONDRA RAY has written 22 books on the subjects of rebirthing, relationships, ideal birth, The Forgiveness Diet©, A Course in Miracles, healing and holiness, and the many mental & spiritual imperatives in life… and many other deeply pertinent subjects in our quest to Lovingly integrate ourselves in these modern times. In her best seller, The Only Diet There Is, SONDRA shows people how to lose weight by forgiving people, especially themselves.